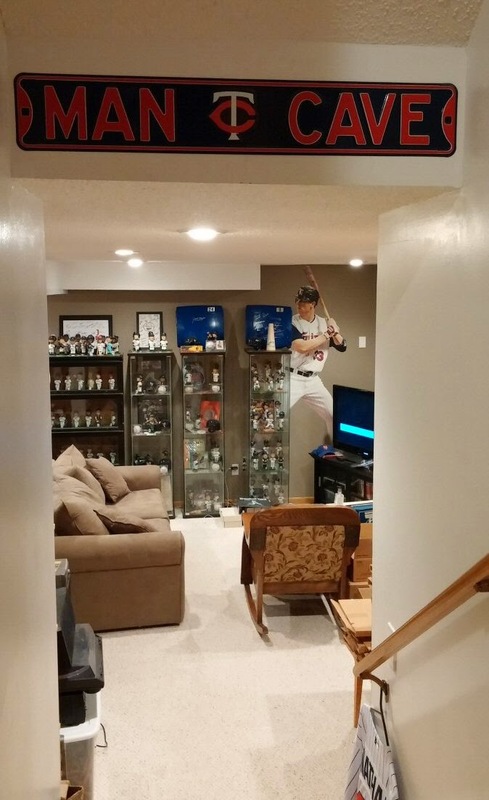 Back in July when my son and I went to the All Star FanFest event in Minneapolis, I bought this Minnesota Twins Man Cave sign. I put it in the stairway leading down to the basement where I keep my collection. I came home to a nice surprise in the mailbox today. 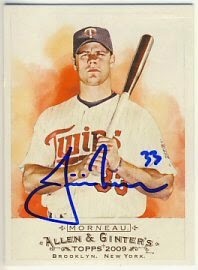 2014 National League Batting Champ Justin Morneau signed his 2009 Topps Heritage and Allen & Ginter in care of the Colorado Rockies Foundation. 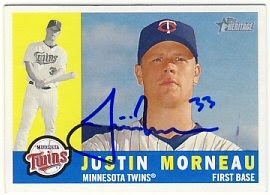 Justin signed cards via the Rockies Foundation for the same price I was paying for him at TwinsFest when he was still with the Twins. I sent these back in the beginning of August and was getting worried that I might not get them back this year. 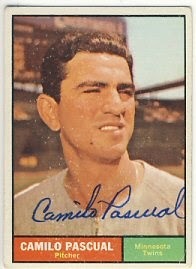 These get me a little closer to completing the Twins for these sets. 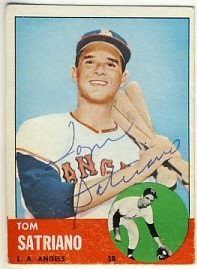 For the 2009 Allen & Ginter set, I just need Joe Mauer. 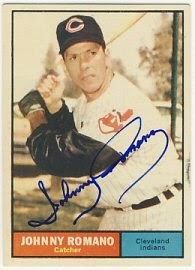 There are only nine Twins in this set, so it's not a huge accomplishment, but I'll try to get Joe at TwinsFest next year. 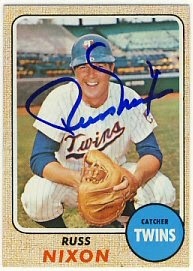 For the 2009 Heritage set, I still need Denard Span, Joe Mauer, Joe Mauer All-Star, Joe Crede and Orlando Cabrera. 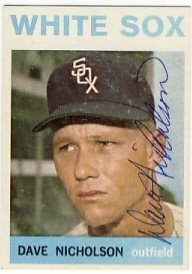 Crede and Cabrera could be pretty tough to get. I spent the day with my wife going through about a dozen antique stores. I usually don't find much of interest in antique stores, and what I do find is very overpriced. Today was no exception. 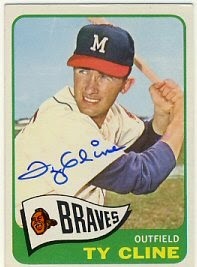 I did manage to find a Life Magazine with Carl Yazstremski on the cover for $3, but that was it. 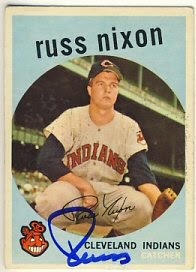 I was happy to come home and find a return from Russ Nixon in the mailbox. 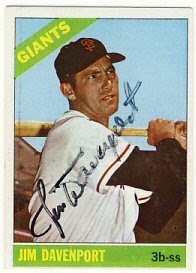 He signed his 1959, 1963 and 1968 Topps for me. 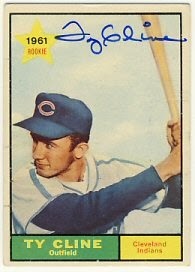 It looks like he forgot to sign his last name on the 1959 though. 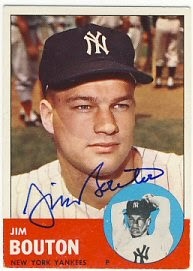 Bob Anderson and Jim Bouton each signed their 1963 Topps. 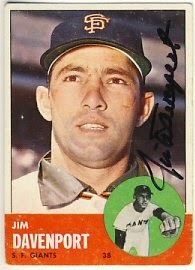 Well, a reasonable facsimile anyway. 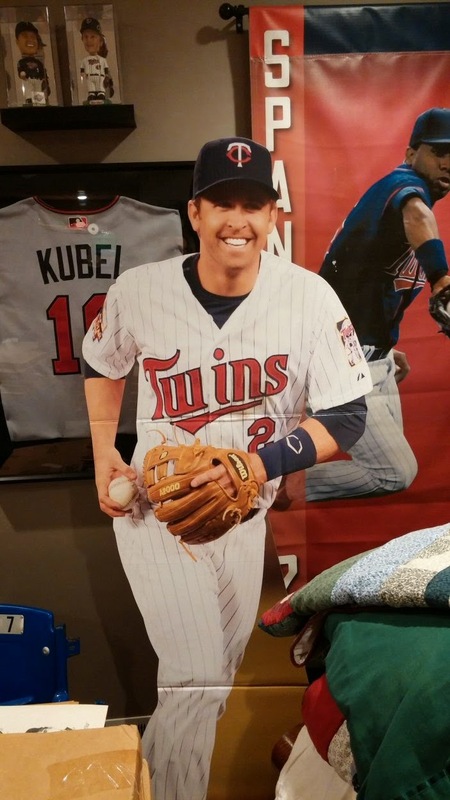 The Twins gave out Brian Dozier cardboard cutouts to their season ticket holders. 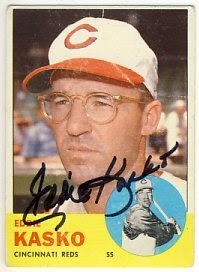 I"m not a season ticket holder. 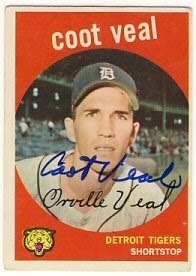 In fact, I didn't go to a single game this year. 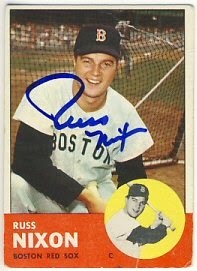 But I really wanted one so I bought it for a reasonable price on eBay. 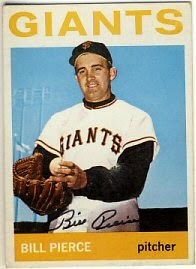 They also gave out 1500 Brian Dozier bobbleheads to some season ticket holders. 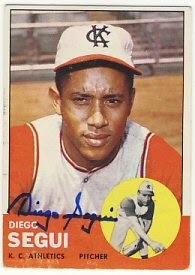 I'm trying to get my hands on one of those too, but those aren't too cheap. Another return today. 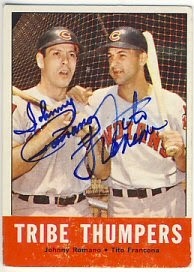 Johnny Romano was kind enough to sign four cards for me: 1961 Topps, 1963 Topps, 1963 Topps Tribe Thumpers already signed by Tito Francona and a 1964 Topps. Just one return today. 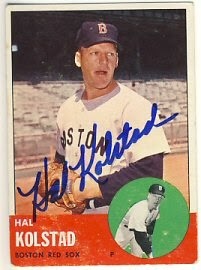 Hal Kolstad signed his 1963 Topps. 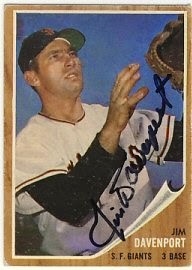 I'm not sure I have many more cards to send out, but I'm going to spend some time tonight digging around to see what I have. 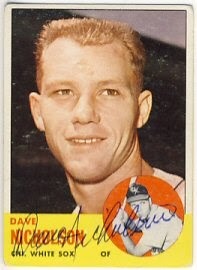 There's another card show in a couple of weeks where I should be able to get some more. I was out of town for the last couple of days and had a few returns waiting for me when I returned today. 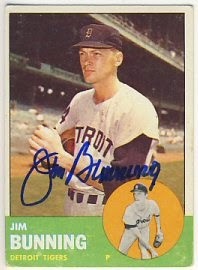 Jim Bunning signed his 1963 Topps. 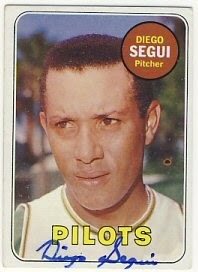 Diego Segui signed his 1963, 1964 and 1969 Topps. 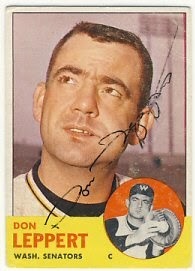 Don Demeter signed his 1963 and 1964 Topps. 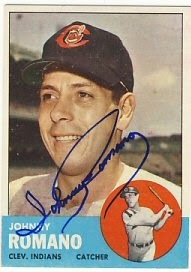 And Jim Hickman signed his 1963 Topps. 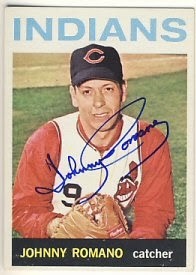 Just one return today. 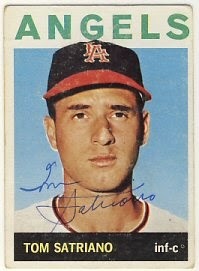 Tom Satriano signed his 1963, 1964 and 1968 Topps. 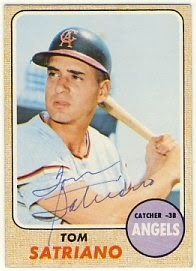 I think this makes 103 signed 1963 Topps and 72 signed 1964 Topps. I've got a long way to go! 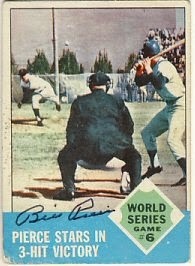 I've also been contemplating starting the 1978 set, since it was really the first set I collected as a kid. 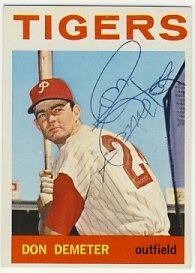 I'll keep going on the 63's and 64's but when it starts to get tough, I'll switch over to the 78's. 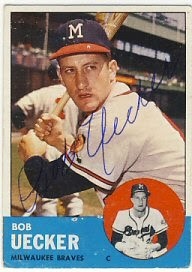 More returns today, including on from Bob Uecker! 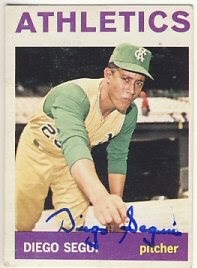 He's a great signer via the Brewers address and I can 't believe I haven't sent to him before now. 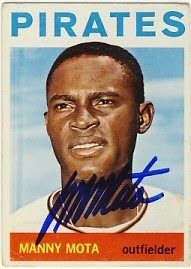 He signed his 1963 Topps for me. 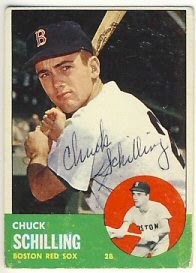 Craig Anderson and Chuck Schilling also signed their 1963 Topps. 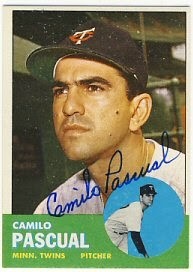 And Camilo Pascual signed his 1961 and 1963 Topps. Lots of returns today. 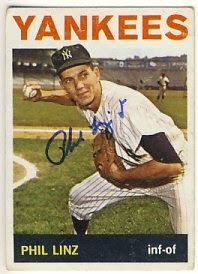 It's taken me a while to scan them, update my web site catalog, post the returns on SCN, and update my wantlists on SCN. I'm not sure what takes longer: making the request or recording the return. 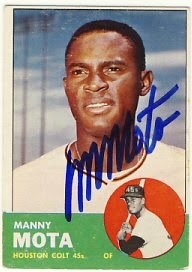 Manny Mota signed his 1963 and 1964 Topps. 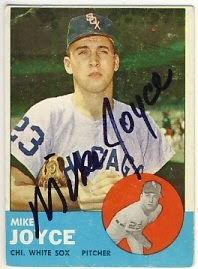 Mike Joyce signed his 1963 Topps. 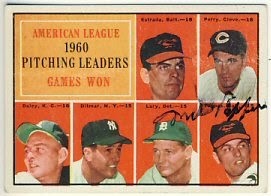 Milt Pappas signed his 1961 Topps Pitching Leaders. 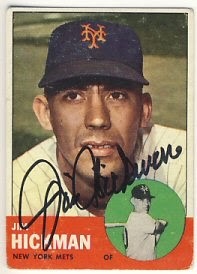 Jim Davenport signed a 1962, 1963 and 1966 Topps. 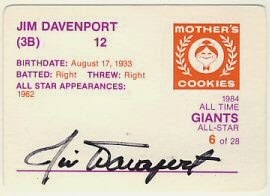 He also signed and enclosed a 1984 Mother's Cookies card. 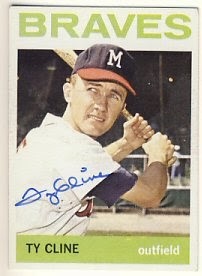 Ty Cline signed a 1961, 1964 and 1965 Topps. 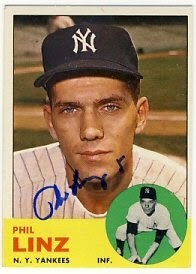 Phil Linz signed a 1963 and 1964 Topps for me. 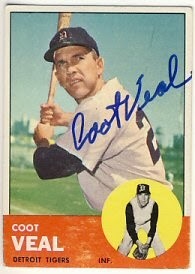 And finally, Coot Veal signed his 1959 and 1963 Topps. I still have a lot of requests out and hope to send out some more this week too. Two more returns were waiting for me when I returned home after being gone a few days. 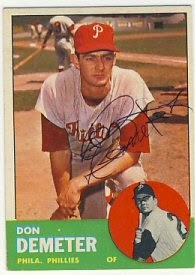 Both Eddie Kasko and Don Leppert signed their 1963 Topps for me. 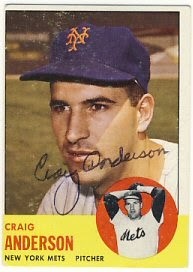 Dave Nicholson signed his 1963 and 1964 Topps. 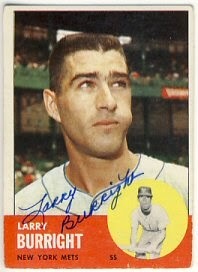 Larry Burright signed his 1963 Topps. I've done pretty well sending out between five and ten requests a week so the returns should continue for a while. I've got about 25 requests still outstanding. Just one return today, but it's a nice one. 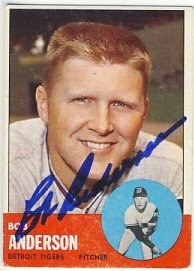 Billy Pierce signed his 1963 Topps World Series card as well as his 1964 Topps for me.